In tradeetional Christian iconography, saunts are aften depictit as haein halos, whilk is a seembol o thair haliness. 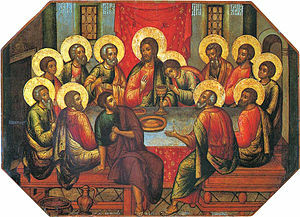 Note that Judas is depicted athoot a halo. Saunts are bodies o exceptional haliness that are important in mony releegions, parteecular Christianity. In some uissages, the wird "saunt" is uised mair generally for tae refer tae onybody that is a Christian. Wikimedia Commons haes media relatit tae Saints. This page wis last eeditit on 10 Apryle 2017, at 14:20.